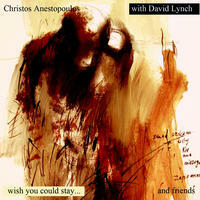 Christos Anestopoulos : Wish You Could Stay. Where east meets west meets jazz meets...classical. Colorful with alternating emotions, playful to happy, while other feelings are desperately dark. This album is a mix between jazz fusion, rock with a lot of folk, and ethnic elements that features the electrical guitar, 12 string guitar, saxophone, violin, lyra, trombone, davul, contrabass, drums and oud. The band interplays on the body of its work instead of always soloing, which results in great synergy and musicianship as well as in an intimate music bond that can be felt on and off stage. Christos Anestopoulos treats his guitar like a wide canvas with no limits in the traditional sense; he isn't afraid to experiment and bring a lightness into his heavy musical thoughts by using some field recording samples (in the intros). "Wish You Could Stay" is an album that thrives in a genre where the listening experience at home is vastly different from the one on stage. And now go jazz out! License Where east meets west meets jazz meets...classical by Christos Anestopoulos for your project. Play the music of Christos Anestopoulos in your restaurant or store.